How many decent detectors in the state of “lightly used”, with a price of about $ 100 do you know of? Metal detectors for children do not count. I cannot list such detectors. Suddenly, if you know good and cheap detectors, then say it in the comments. 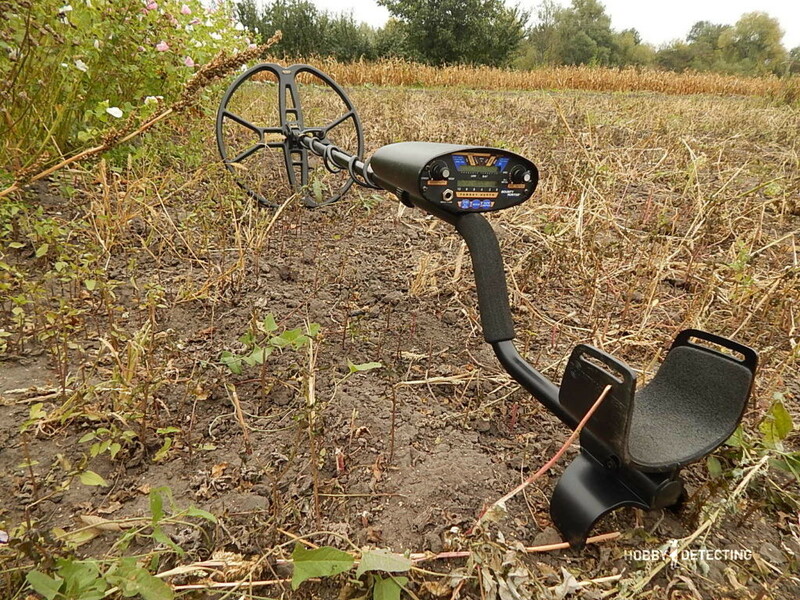 $ 100 – is it much or little for a good metal detector? 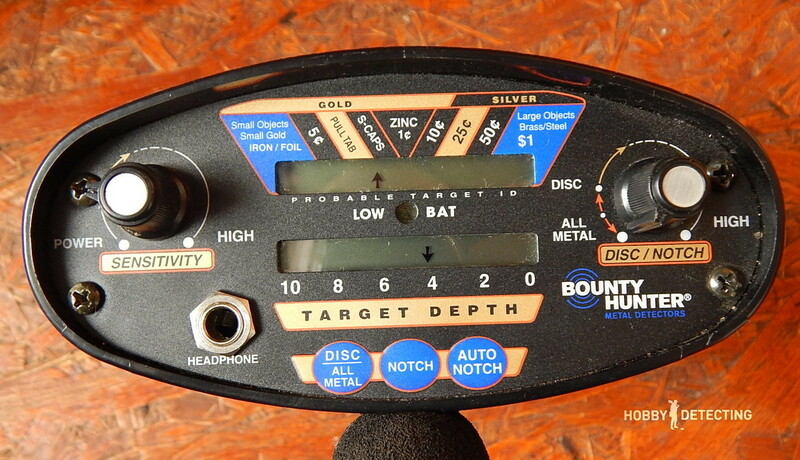 Personally, I think that not much, so when I saw an announcement about the sale of a Bounty Hunter Pioneer 202 for a hundred bucks, then without thinking I bought this American metal detector. I really wanted to try the Pioneer 202 to understand why it costs that kind of money. What impression did the American detector leave about itself and what did it eventually become with my purchase? It is clear that I cannot compare the model 101 with the “older brother”, but from memory, I can draw the following conclusion: the two hundred and second will be better in everything. 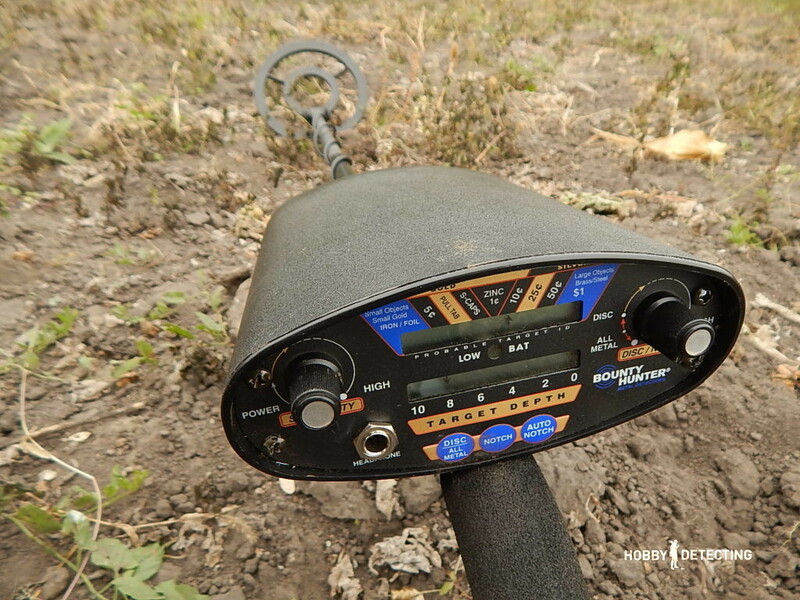 My Pioneer 202 began its treasure hunt in the vastness of Ukraine in 2014, although it was made at the end of 2013. For people who don’t know: the Bounty Hunter in the battery compartment has a sticker with the date of production. Doing reviews of metal detectors, I usually stop on the package of the detector. This time I cannot do this since the first owner of the 202 did not take care of the box. Therefore, the detector came to me wrapped in tape, which saved it during transportation. First assembling the Bounty Hunter Pioneer 202, I was pleasantly surprised by the “skeleton” of this detector. 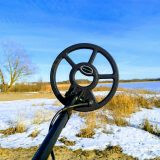 The metal detector is designed for the same three-section, light and very comfortable rod, like my Fisher F44. 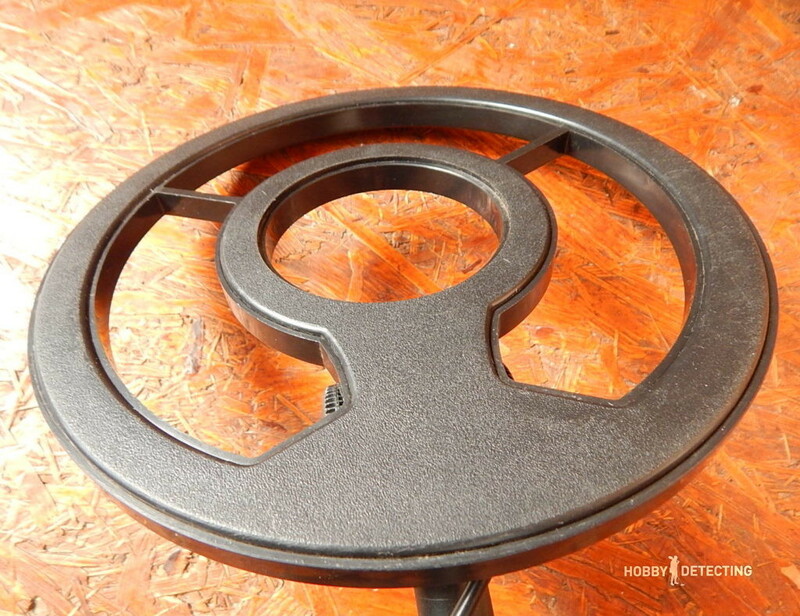 The only difference is that Pioneer does not have a plastic clip on the junction of the lower and middle sections. You see, this is done to reduce the cost of the detector. But, as practice showed: it does not affect the detecting in any way. But because of the bar on the ACE 250 (the same age as Pioneer 202), I’m always frustrated by its flimsy design. The Pioneer 202 was lucky not only with a good rod but also with an armrest, which, in my opinion, is very well designed. 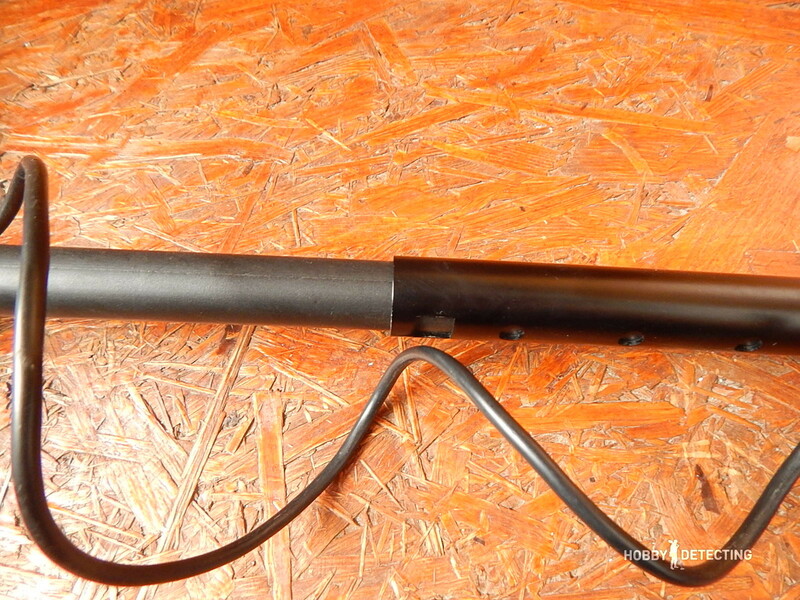 The coil at the metal detector is round with a diameter of 8 inches. It will be more than enough for a beginner digger. Unlike the standard Garret ACE, the Pioneer has a glossy fill hidden behind a fixed protection. I’m sure that this design is more reliable than the ACE 250, where the special coil does not wear a special cover because when working, it will scratch and chop the bottom part. 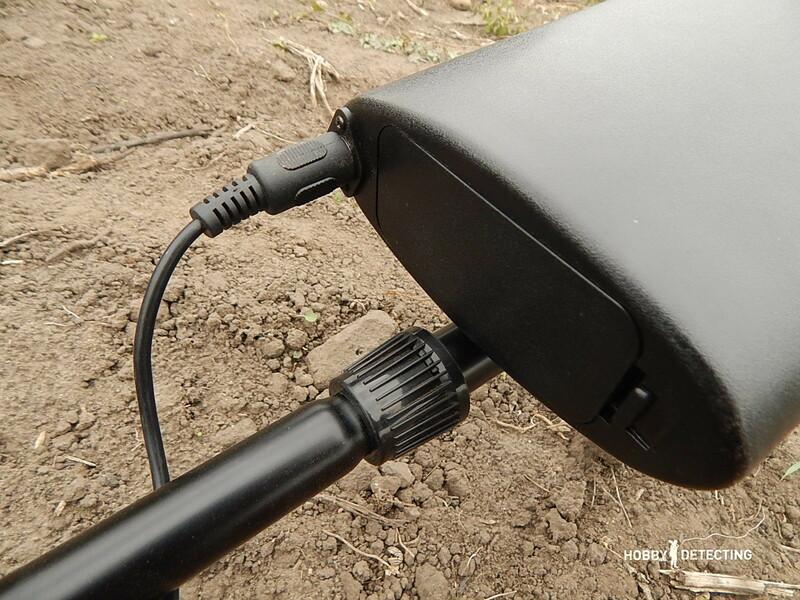 The BH 202 has a 5-pin (DIN) coil connector – it allows you to connect it much faster than with a plug with a locking nut. But, this DIN connector is morally obsolete, although I personally do not see anything wrong with it. The coil is fastened to the plastic rod with the help of a proprietary bolt, but there are no sealing rings under the ears. Because of its non-versatility, I do not like such bolts on reels. But on a single metal detector, they perform their function completely. 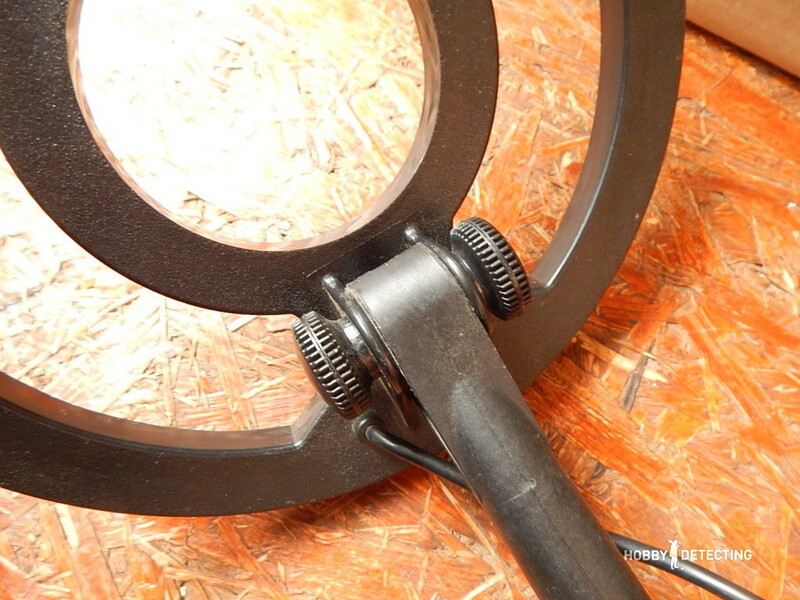 The electronics unit is rigidly fixed to the rod. It has an interface on the front side, and a battery compartment and a coil connection socket from the rear. It seems that everything is classically and there is nothing to complain about, but there is one “but”: the coil connector is not hidden. It sticks out and as if asks: “Hit me” or “cling to me.” Here this design flaw does not affect the detecting, but here the state of its fastening affects it in the most negative way. The front panel of the Pioneer 202 I liked – it is friendly, understandable, informative, convenient. 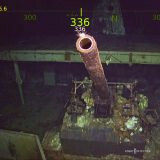 To control it, even the detector can be turned on with just one finger, while holding the detector with the same hand. The control is thought out in such a way that it makes it possible without stopping to adjust the parameters of the metal detector during the detecting. As you can see, the interface of the 202 consists of two liquid crystal screens, three touch buttons, and two potentiometers. There is also a socket for connecting headphones with a standard (large) jack. 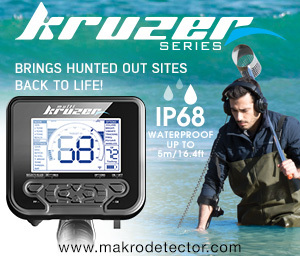 The Bounty Hunter Pioneer 202 detects the find in three tones: low, medium and high. 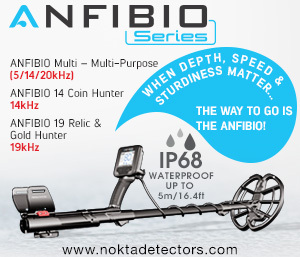 When you are detecting for valuable items, you will not even have to look on the screen – the sound identification is enough to make a decision to dig or pass by. 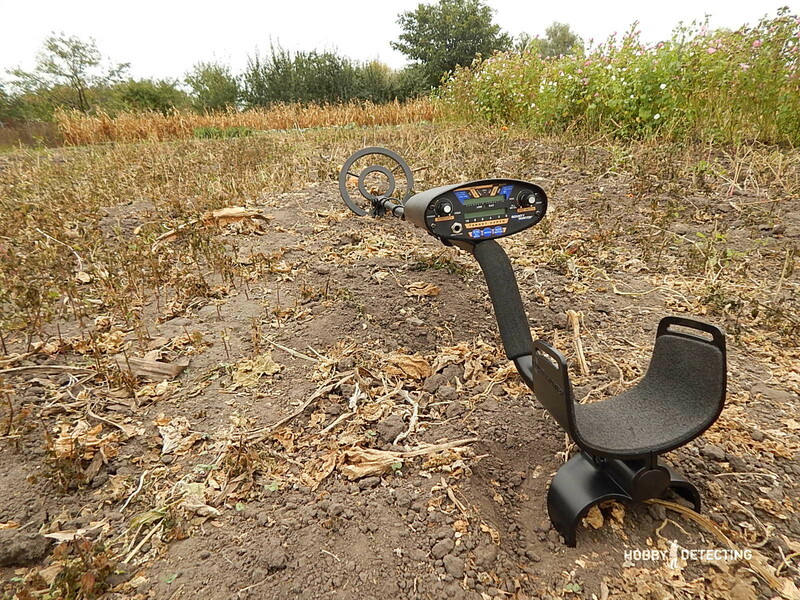 To understand the real capabilities of a metal detector, tests are needed. On the ground, in its constituent similar to the soil near the abandoned houses, I dug a pit, in one of the walls of which, I made holes in different places distant from the edge. Putting a coin in a certain cell, I can see the depth of detection and the quality of the reaction of the metal detector. Actually, now everyone can see at what depth Pioneer 202 will find a coin with a diameter of 25 mm (in our case it is 5 kopeks from the USSR from 1957). As you can see, the Pioneer 202 took out a test coin with a clear two-way response at a depth of 20 centimeters (that’s not enough!). 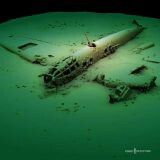 But already at 22 centimeters to identify the target, it could not. The metal detector did not see a deeper coin. The result is simply gorgeous since the Garrett ACE 250 tested in this place and for the same purpose in 2015 (new firmware) and the result was the same! Turning off the camera, I did another Bounty Hunter test. Since there were batteries in the detector with which I bought it, then on the same galvanic cells it worked for an hour with a metal detector and I took the test. It was clear that there was not much charge left in the batteries. But, the discharge indicator of the batteries did not shine, so I continued to use the detector. And that’s what I wanted to check with the Pioneer 202: Does the depth of detection decrease when the level of charge in the batteries decreases? When I was going to take a test, just in case (I was not sure of the batteries that had been standing in the metal detector for a long time) I took with me a set of new sealed alkaline batteries. And after the test, knowing the maximum depth of detection on old batteries (22 cm), I installed new batteries in the detector. I took the same settings, the same objects, and the same depth. The result pleased me: The Pioneer 202 on new batteries saw the coin exactly on the same depth as on the old ones. 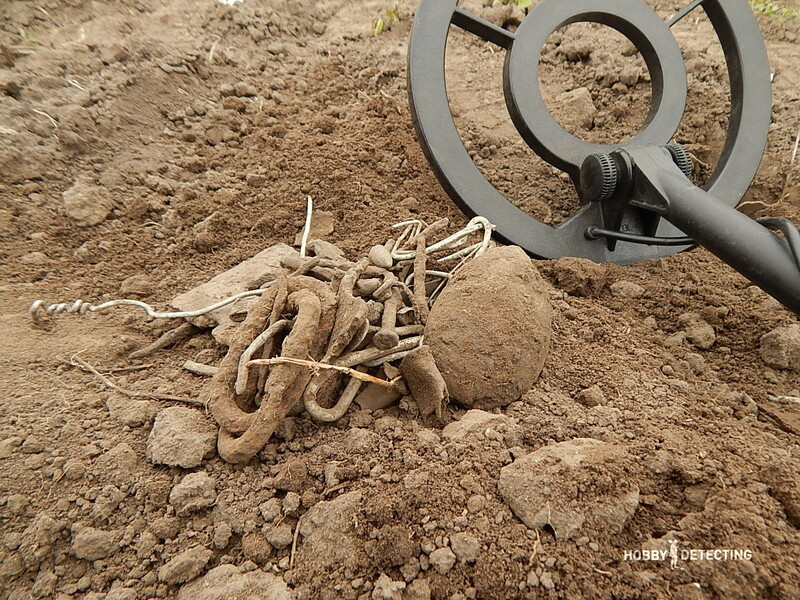 Now the BH 202 will pass the test with a real difficult detecting – and I’ll go with it to the cultivated land. 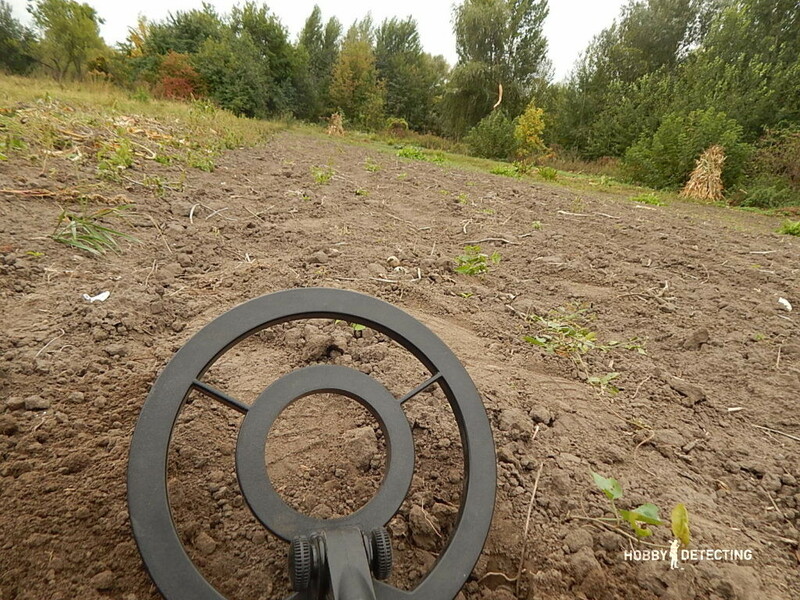 In the post-Soviet kitchen gardens, there are so many different scrap metals that this gives me an opportunity to understand almost immediately what targets are being noticed, and which metal detector is missing. Half an hour detecting of color and questionable responses in all three modes in turn and I already have a pocket stuffed with finds. Of course, they are garbage, but they clearly demonstrate that the Pioneer 202 vacuums everything. In my opinion, the Bounty Hunter Pioneer 202 searched with the tests perfectly! 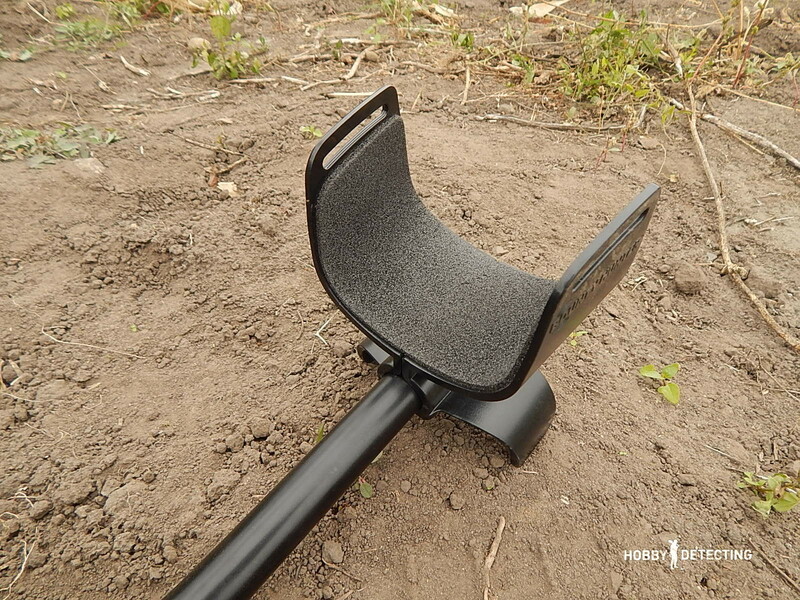 How to set up a metal detector, it’s better to read it in the instructions, and I will share my opinion on the operation of each mode. DISC / ALL METAL – this mode is the deepest. 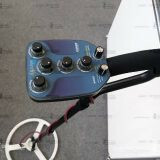 Put the sensitivity in the maximum, the right potentiometer in the leftmost position – and hear all the responses (three-tone) from the metal targets, to which the scanning beam of the coil can reach. NOTCH – by pressing this button, we exclude all metal targets from the detection, but do not touch the right adjuster. The depth gets lower, but the stability is greater. AUTO NOTCH – this discriminating mode is very similar to that of the discriminator of more expensive metal detectors. There you can already hear all the color responses, even if they are false. The depth is, as it were, average between the two previous modes. Information about what detecting mode is now activated on the Pioneer 202 interface is not present, and if you need to make sure that the required detecting program is now enabled, just press the corresponding button again. The Bounty Hunter Pioneer 202 is equipped with a relatively small search coil. It is reasonable that, having gained experience in metal prospecting, the owner of a Pioneer 202 will want to increase the depth and area of scanning of his metal detector. You can do this simply by purchasing a coil. But, the Bounty Hunter series Pioneer we are not so popular, so with the detecting for a new sensor, there will be difficulties. But! On the internet, I found information that the Pioneer model 202 fit coils from Fisher F2 and F4 and the BH Discovery 1100/2200/3300. But, at the Pioneer the connector of connection is identical with the Discovery ruler, therefore we are looking for the coil to these detectors and calmly put them on our BH 202. It turns out that it is possible to put NEL coils on the Pioneers. BUT! Since the manufacturer does not do this for this model range of coils, it does not guarantee their correct operation. After the Bounty Hunter Pioneer 202 test, one question remains: why is Garrett ACE is so popular among us? After all, there is nothing in these metal detectors that would be better than the Bounty Hunter’s. My tests and the time spent with the Pioneer 202 clearly say that this metal detector should have been no less in demand than the ACE 250. Absolute smashing article my friend. VERY well done. I just purchased a BH 202 due to this article. I am a total newbie to metal detectors and metal detecting. Which me luck! Looking for that gold and 10 caret diamond ring! Thank you, I’m very happy to hear that! 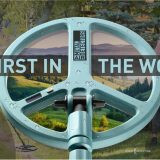 I believe that you’ve made a great choice for starting off in the world of metal detecting, and of course, very good luck to you! I myself started out with a metal detector for 50 bucks or so and worked my way up. The main key to remember is to never give up, no matter how hard it seems! There will be all kinds of days out detecting, but in the end, you’ll find your 10-carat diamond ring. Because remember, the one who seeks finds:) Once again good luck, and if there should be any questions, do not hesitate to contact us.